Norwegian Tusmorke (Twilight) is a mysterious, practically non-metal outfit taking a lot of influences from older dark-prog and kraut-rock bands I have not heard before. Since I can’t comment on any of the aforementioned references on Underjordisk Tusmorke I have to draw this review upon the images the album conjured in my own head. Blended with Nordic folk and pagan influences, Underjordisk Tusmorke is described as dark, progressive and psychedelic. While definitely involved in the compositional sense, so you can legitimately call this music progressive, I am not sure about the darkness expressed here. What provided in heaps, however, is psychedelia. This album at times is pure Woodstock and flower power. Fimbul is practically soundtrack music to my parents’ youth. Flowing, happy, sometimes not serious, prodded on by tambourine and flute, Fimbul calls to tuck your long locks of hair under a colorful headband and to go jumping wearing a lengthy robe in some grassy green meadow. Even vocals of Tusmorke, higher tone clean male voice, bring a touch of the feminine edge, androgynous ambiguity being another feature of the album I sensed strongly. 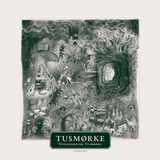 At times Tusmorke lays their melodic stories carefully (The Quintessence of Elements), with mellotron and Hammond organ providing that 70s twist. A Nightmare's just a Dream has its beautiful melody on par with Green Carnation Acoustic Verses, and Hostjevndogn is calm, serene and dreamy, with that characteristic cold Nordic feeling of Ihsahn’s Hardingrock project, made a bit more modern and astral once the organ kicks in. But, then, I am not 100% Tusmorke is always serious. If that psychedelia is mushroom induced, A Young Man and His Woman can be definitely construed as a joke, and going off-beat in the chorus of The Quintessence of Elements is also an interesting decision. Compositions on Underjordisk Tusmorke switch tempos, ratchet from quiet to surreal (A Nightmare's just a Dream), and periodically do not know when to stop piling on. Silly dance in the end of Hostjevndogn reduced impact in my opinion, but ending up Gypsy/Hebrew motif of Singers & Swallows after taking a mysterious walk is refreshing. Dark, however, this album never really got to be until Salomonsens Hage brought more weightiness with its Per Gunt riffs. But then, again, this walk in the woods turns part danger – part theatrical laughs, so one never knows for certain. The closer Ode on Dawn is a marathon story, building up in a largely instrumental fashion, with a few vocal lines also gender-neutral as before. The bass lines on this track are absolutely exquisite, from early brood to the unfolding jazzy rampage. Just listening to that instrument could be a reward in and of itself. The shape of the Ode on Dawn journey’s end is somewhat booming and threnodious, a little unexpected, but very few things unfold on Underjordisk Tusmorke as you anticipate they would. For those not afraid to relive (or travel back to visit) the 70s, not demanding a metal note in every riff, ready to enjoy multiple profound flute solos - you will have to don a robe before putting this music on, just like Tusmorke musicians do themselves. To my liking, however, instead of going into dark snowy woods I would head to the sunny fields wearing that garb while listening to the album.